[Enter any tried-and-true marketing tactic] is dead. We’re reminded daily about how change is coming, and to succeed in business, we must remain agile. Sure, that all makes sense in theory, but in practical application, to change how we operate or serve customers is no small feat. According to Mckinsey, 70% of change programs fail to achieve their goals, largely due to employee resistance and lack of management support. This doesn’t mean employees are wrong -- they simply lack understanding and buy-in. As a leader, it’s your responsibility to guide your team through the end result and help establish this comfort and buy-in. The good news is there are tons of change management methodologies that you can adopt and adapt to your business. At IMPACT, we’ve gone through quite a bit of change recently. 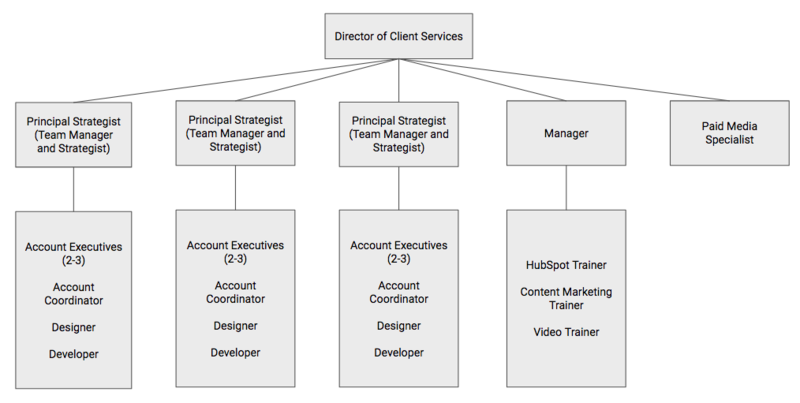 We’ve almost tripled in size in just over a year, and what was once a small core team, is now a fairly good sized-agency that requires a much different approach to implementing change than the good ol’ days (a.k.a. last year). After struggling to implement a change to our client onboarding process, we decided to take a step back and re-evaluate our approach to change management. Below I’ll share with you the key change management models and tools we reviewed, and how you can avoid becoming another statistic. Change management is the systematic approach of utilizing the people within your organization to minimize resistance to and affect organizational change. Yes, there are tools and models, which I will get to below, but at the core of any strong change management program is your people. No model will work if you continue to let employee resistance and lack of management support sabotage your efforts. No need to dust off your old college business school books. Here are the top 4 change management models most commonly referred to when researching the “how” behind change management. This sounds like the most simplistic model on the surface, but there’s a lot to unpack. In the unfreeze stage, you are essentially breaking down the current way of doing business and noting what needs to change. It’s crucial in this stage to obtain two-way feedback of what needs to change (vs. solely top-down). After noting and communicating the need for change, gather the key stakeholders necessary to proactively implement what needs to be done. Once everyone has bought in, “re-freeze” in the sense that the change is institutionalized and consistently used in the new manner. In our experience, this model focuses more on process than people. If you have a smaller team with less emotion to manage, this could be a good option. The ADKAR® model breaks down the human side of managing change. The idea is you should work through each letter of the acronym, focusing heavily on the individuals within your company. Awareness. Here, the goal is to learn the business reasons for change. At the end of this stage, everyone should be bought-in. Desire. This is dedicated to getting everyone engaged and willingly participating in the change. Once you have full buy-in, the next stage is measuring if the individuals in your company want to help and become part of the process. Knowledge. In this stage, you’re working towards understanding how to change. This can come in the form of formal training or simple one-on-one coaching so those affected by the change feel prepared to handle it. Ability. Next, you must focus on how to implement the change at the required performance level. Knowing the required job skills is only the beginning; The people involved need to be supported in the early stages to ensure they are able to incorporate change. Reinforcement. Lastly, you need to sustain the change. This final step is often the most missed.An organization needs to continually reinforce change to avoid employees from reverting back to the old way of doing things. Unlike Lewin’s model, this focuses on people-side of stage. We like its idea of using reinforcement to make your changes stick and this model takes it a step further. It’s a good approach to consider if you have a larger team or more complex problem you’re trying to solve. In is 1995 book, Leading Change, Harvard Business School professor, John Kotter, lays out 8 stages all companies must go through in order to see effective change management. Create urgency through open dialogue that leads others in the organization to want the change as much as you. Form a powerful coalition of change agents in your organization. This can go beyond leadership and manager. Create a vision for change to reinforce the why behind it and the strategy to achieve the end result. Communicate the vision regularly to ease team anxiety and reinforce the why. Remove obstacles to pave the way for the needed changes to happen. Create short-term wins to keep up morale and show the team you’re moving in the right direction. Build on the change by analyzing what went well and didn’t go so well in your quick wins to keep pushing to the desired end result. 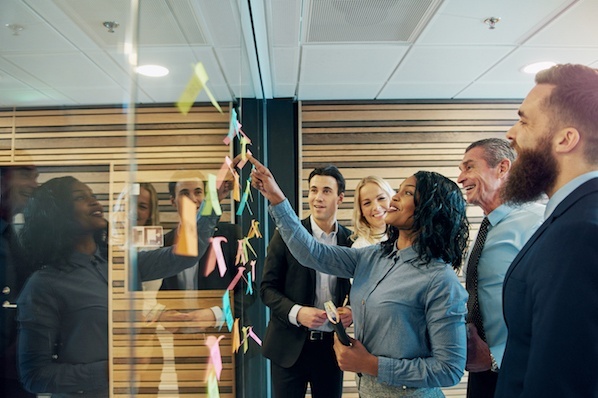 Anchor the changes in corporate culture as standard operating procedure and reinforce why change is necessary and embracing it is part of your company culture. If you have a more agile team, this model’s iterative short-term wins and building based on what you learn as you go, sync nicely with the agile methodology. Okay so maybe this one isn’t as common yet, but it soon will be, so you might as well get ahead of the curve! Listen: Listen to the ideas of your team and create a culture where they listen to each other. Clarify: Make sure these ideas aren’t crushed before everyone has a chance to understand their potential usefulness. Debate: Create an environment where it’s okay to debate and make the ideas even better. Decide: Select the idea that will best solve the issue. We included this in our mix at IMPACT because of how much it focuses on obtaining ideas from the frontline. People buy into what they help create and Kim Scott’s GSD model provides a framework to make that happen. Now, there are many more models for you to choose from than just these four, but realize there may not be just one model that fits your organization best. If you’re anything like us at IMPACT, you may want to take a page from several of these models to improve your communication and effectiveness in times of change. Below is a real example of how my team approached a major change and the change management steps we took to ensure everyone was on the same page and moving in the same direction. This structure worked for us in 2017, but as we came into the new year with an even larger team, our quarterly team survey results told us a different story. For the first time in several years, not everyone could see their future at IMPACT. Some had no idea what was going on or why certain decisions had been made. And what stung the most is we had a few happiness scores below seven, which we haven’t had since 2015. In our February leadership team meeting, we debated for hours why some in the company were feeling this way. After several ideas, we all determined one area we should focus on was our structure. We were setting our managers up for failure with competing responsibilities and in doing so, we made it extremely difficult for them to effectively communicate with their teams, coach them in their careers, and ensure they could see their future at IMPACT. The ones who did better in this area suffered in others, like client results and retention. It was a huge issue that needed to be solved immediately. Determine what needs to change and craft the message. In our monthly all-hands meeting following that leadership team meeting, our CEO, Bob Ruffolo, explained the why behind our decision that we needed to make a structure change -- the what. He explained the survey results, our thought process, and everything that led to the conversation. Then, he explained that we had outgrown our current structure, placing too much responsibility on our current managers. We inadvertently set up our teams to fail and that wasn’t ok. -- the message. In order to improve this situation, we needed to create a structure that scales. Planting the seed for a change is seriously just the first step. After this meeting, we knew there would be fear and confusion, so we got to work on step 2. We knew that a complete structure change would not go well if it was strictly a top-down initiative. We needed help and a core coalition to get it off the ground. However, not every single person would need to know every single detail of what was going on. While all teams were involved, most were focused with how they would personally be affected in a day-to-day sense, as well as in relation to how they work with other teams. 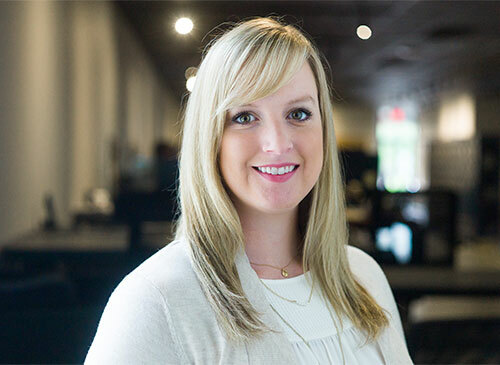 To keep communication clear, and to ensure everyone had a voice and a chance to enact Kim Scott’s debate stage, we needed to identify stakeholders across the agency team. In this case, our stakeholders were the managers of our teams. We were essentially changing their job responsibility, so it was prudent to include them in the conversation. Although we created a committee of stakeholders, what we failed to do was take our communication a step further by managing the other agency team members more closely. The matrix below outlines a way to segment your team and your communication with each segment so you can better communicate across the board. We only had our managers involved, and we updated the rest of the team all at once in our monthly all-hands. Next time, we will definitely create a strong communication plan based on this matrix. Image from Mindtools, which adapted from Mendelow, A.L. (1981). Environmental Scanning - The Impact of the Stakeholder Concept,' ICIS 1981 Proceedings, 20. Once we identified our key stakeholders, we met with each one and some of their teams to get their feedback, pushback, concerns, and ideas about the structure change. In full transparency, not all these meetings were fun. There was high emotion and rigorous debate, but, at this point, we had not zeroed in on our exact plan, and they helped us understand the team’s concerns and ideate on the best way to structure for scale -- together. This is an area we got wrong in this scenario. In step one, we announced at a company meeting a pretty earth-shattering idea. Our managers felt blindsided and not all the team members were convinced a structure change was needed. We learned the hard way that surprising people in a company meeting was not the way to go. Our intention was to be transparent about what was discussed in our leadership team meeting, but there was definitely a better way to do that had we been more systematic in how we communicated to the team. CEO/Leadership team (if it’s a leadership decision) > communicates to the next level management > who then communicate to the frontline managers and key stakeholders >who then communicate to the the rest of the team. Managers can communicate to their own teams in a style that they know will resonate and create shared understanding. They can also help identify issues and concerns so we can all co-create a solution. This eliminates group-think and reduces the timeline to extinguish fear. Then we moved onto Step 4. At this stage, everyone knew a change was coming, but no one knew how we were going to make it happen. This was the time to get organized and get buy-in on the “how” of change management. Now that we knew what our new structure would be, we developed a project plan with the incremental steps to get us there by the end of the quarter. We created a video explaining the structure and project plan for all teams to review in their weekly meeting. Our managers and key stakeholders were involved and accountable for different parts of the plan, and in our all-hands meetings, we updated on the progress of the plan so everyone could stay informed. In our plan, we also mapped out some “quick wins” in the first month so the team could feel major progress was happening. In our case, this was selecting new team managers for those teams whose Principal Strategist moved over to the Strategy team. We interviewed internally and selected our new managers within 3 weeks of rolling out our initiative, which was exciting for our new managers and exciting for the team to see we’re already making huge steps. It’s one thing to have great communication and a solid-looking plan -- but change is hard. 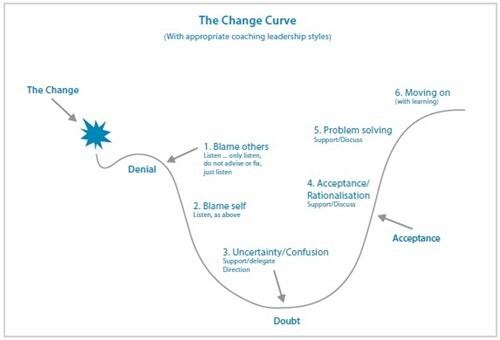 Everyone responds in their own way, but what we didn’t think about was this concept of The Change Curve. Ok, let’s be honest -- we didn’t even know this existed. As we went through the process, we learned another lesson the hard way: We needed to adapt our communication and management style for each individual based on where they were in responding to change. 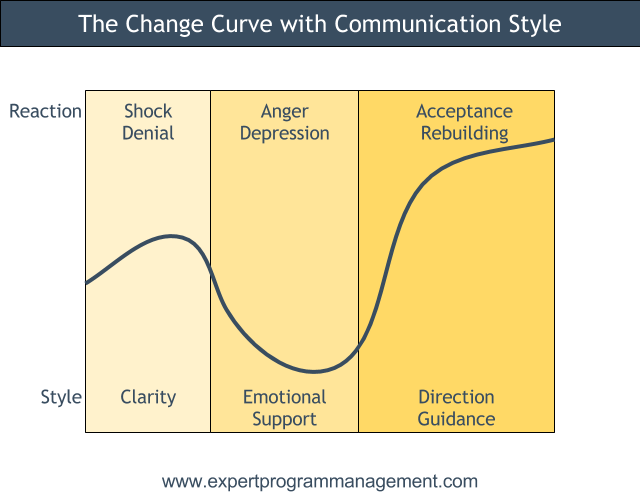 The graphic below by Expert Program Management shows how you change your response along The Change Curve to gain buy-in sooner and give better coaching to your managers. By meeting team members where they are at, our managers could adapt their communication style to coach each team member through the process, allowing for more personalized, effective transition. Note: This doesn’t have to be advice just for managers. Our teams operate in scrum, and in their team retrospectives, a shared understanding of this tool could have facilitated more understanding and stronger conversations and problem solving within the team. In order to stay focused throughout the quarter, we created an objective and corresponding key results (OKRs) for our structure change. The objective was essentially “make the structure change happen” and we measured by tracking the milestones from our project plan. This was also a time for those working directly on the project plan to celebrate and give themselves a pat on the back. There was a ton of work involved, and they deserved to be recognized for crushing it. By breaking down exactly what needed to happen, we were able to keep the team focused and motivated to reach our goal. As I mentioned in step 1, discussing the idea is seriously only the first step. To keep everyone motivated, organized, and informed, we had to communicate like crazy. There three types of communication we focused on: motivational, informational, and two-way. Our motivational communication often came from our CEO to continually reinforce the why behind this major change. Informational communication came from updates on our OKRs in our all-hands meetings, as well as one-off videos from the team working on the project plan to update on progress. The most important one that we focus on the most now, however, is two-way communication. We started off slow in this area, but after getting feedback in our Q2 team survey and from individuals on the team, we doubled down on this much more in the last month of the transition. By ensuring you have a regular cadence of two-way communication, you ensure the team understands what’s being shared, but you also learn and address if there’s underlying dissent or miscommunication. Although I put this as the last step, this is the most crucial. Communication must happen throughout your entire initiative or you’ll risk falling short and potentially damaging company morale in the process. If you focus on the 3 types of communication above, you will reach your goals faster with a happier team to boot. The reason I included Kim Scott’s GSD model is it most relates to our company culture. We are always looking for ways to improve, which means we have a lot of change going on all the time. There is rarely a beginning and a clear-cut end like the more traditional models. I’m sure we’ll discover more tweaks we need to get our structure right, and that’s okay. The point is change really is constant, and developing a model that works for your business is the best way you can manage the people-side of change and set everyone up for success. As a leader, you can choose a model, or a mix of models like what we do at IMPACT, to help organize effective, lasting change in your organization. By incorporating your team via the communication methods outlined above, you can empower and enable your team to take action -- and have pride in the change they helped make. Change isn’t easy and it isn’t going anywhere, but when you can figure out a model that works best for your company, you and your team have no limits.